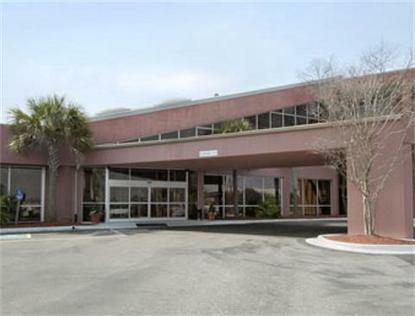 The Ramada Charleston, SC is situated off Interstate 26 Exit 209 at Ashley Phosphate Road. The Carolina Ice Palace is only half a mile away and the Charleston International Airport is only 6 short miles from the Ramada's front door. The contemporary and comfortable accommodations of the Ramada Charleston hotel await your arrival in scenic Charleston County SC. Local attractions include Historic Downtown Charleston including Rainbow Row and the Battery, Historic Summerville, the Charleston Area Convention Center Complex and the North Charleston Coliseum. Centrally located, we are close to where you need to be. Charleston Southern University, The Citadel, College of Charleston, and Trident Medical Center are just minutes from the hotel. Whether shopping for antiques, touring Historic locations, finding nature on an Eco Tour, walking the beach or experiencing one of the many outdoor recreational areas, a pleasant night's stay will round out the enjoyment of a day well spent. A short drive waits to sites such as Patriots Point, Charleston Air Force Base, Magnolia Plantation, Fort Sumter and the Family Circle Cup Stadium and the South Carolina Aquarium. The Ramada Charleston offers all guests complimentary High Speed Wireless Internet, complimentary Hot Breakfast Buffet and USA Today. An exercise room, business center, guest laundry, indoor &amp outdoor swimming pool and Hot Tub complete the value provided at the Ramada Charleston. On-site dining is available for breakfast and dinner at the Lighthouse Restaurant and for a light snack and a cool drink relax in the Lighthouse Lounge, both located in the atrium. Every room at the Ramada Charleston has a microfridge, iron and ironing board, coffeemaker and hairdryer making you feel at home the minute you arrive. The Ramada Charleston offers guests 6 separate Meeting/Banquet Rooms with capacity up to 300 people. The Ramada Charleston makes is your perfect lodging choice for a wonderful trip to the Historic Low Country Region of South Carolina.